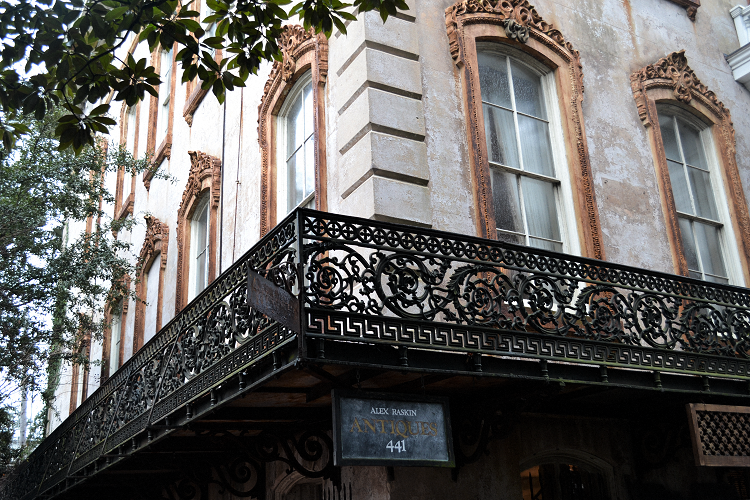 Our bed and breakfast, in the middle of historic downtown Savannah. A fifteen minute walk to the touristy areas, and a quiet area to start and end every day. 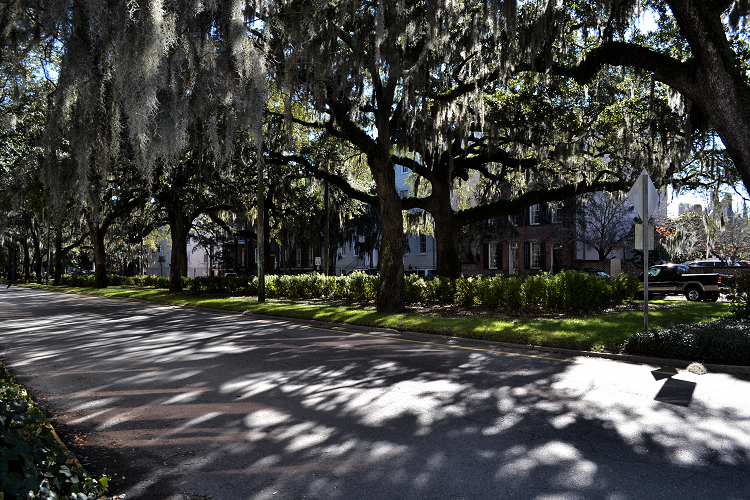 The streets, lined with northern trees, spanish moss, and old period homes. One of the restaurants that we thoroughly enjoyed, Gryphon, a tea place with fresh brunch. 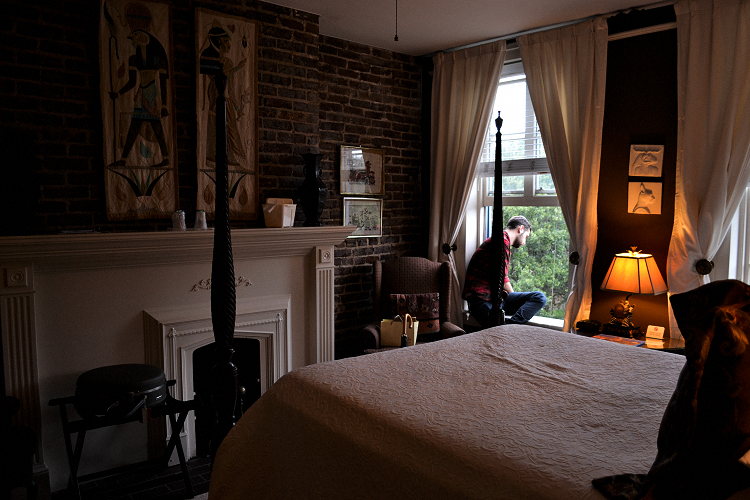 We stopped here on a whim, since it was close to the bed and breakfast. It's owned by SCAD and employs the students. 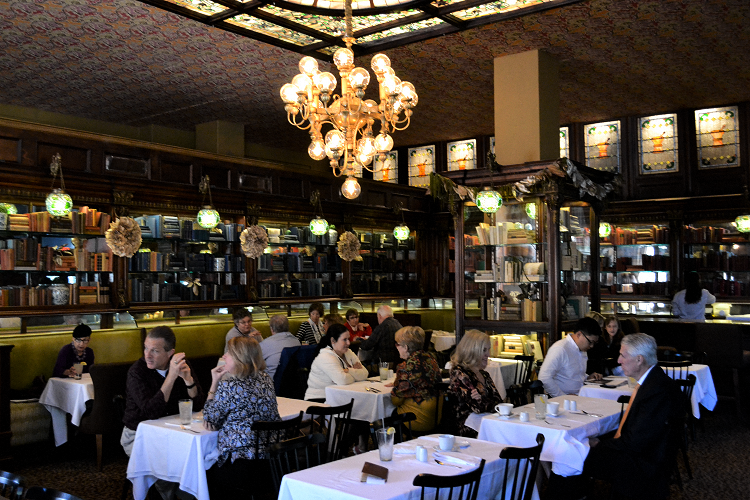 An old pharmacy turned restaurant, they kept all of the built in shelving, and even served our check in an old book. 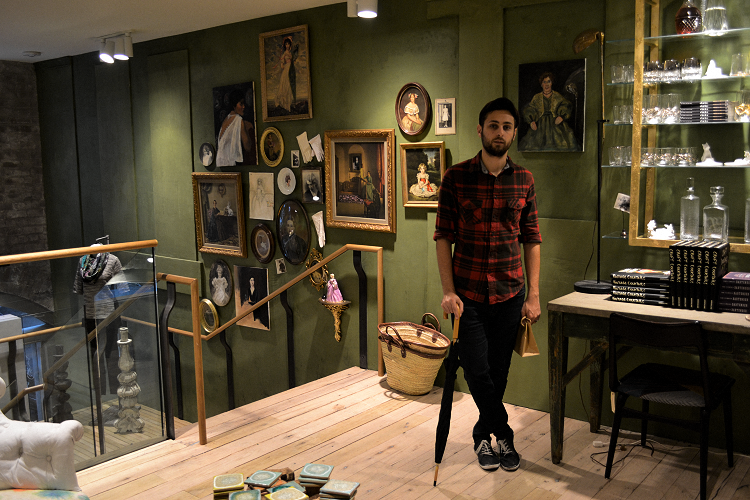 Here, we stopped in one of our favorite shops, Anthropologie. We weren't in the market for anything, and mostly stopped in to admire this wall of portraits and their decanters and glassware for sale. Savannah is the cutest little town with brick roads, ivy creeping up the sides of houses, and trees everywhere. One thing that we could definitely use more of in central Florida is northern trees in our parks. Down here, the palm trees don't shade the forceful sun and there surely aren't any squares. 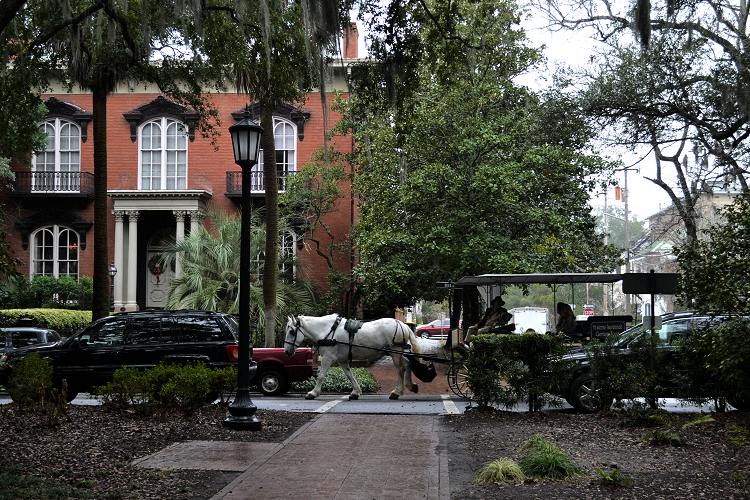 In Savannah, there are historical squares every few blocks. Each one with a different statue, a different history, and even different benches. We could have only wished for one thing to be better, the food. 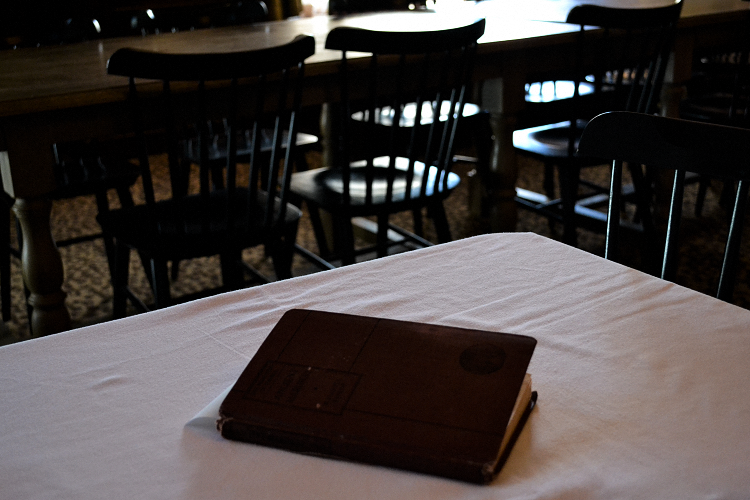 The restaurants were in beautiful old buildings, all kept well, except the menus were lack luster. 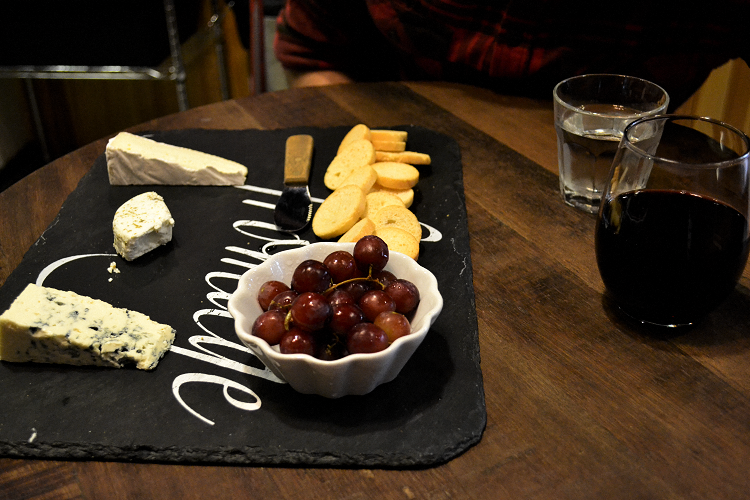 We found three interesting restaurants online, and being that it was a weekend trip, could only chose one for our Saturday night reservation. We chose the most interesting one, and we weren't super impressed. It was delicious, of course, and the wine was one of the best glasses I've had in a long time, but it wasn't that memorable. 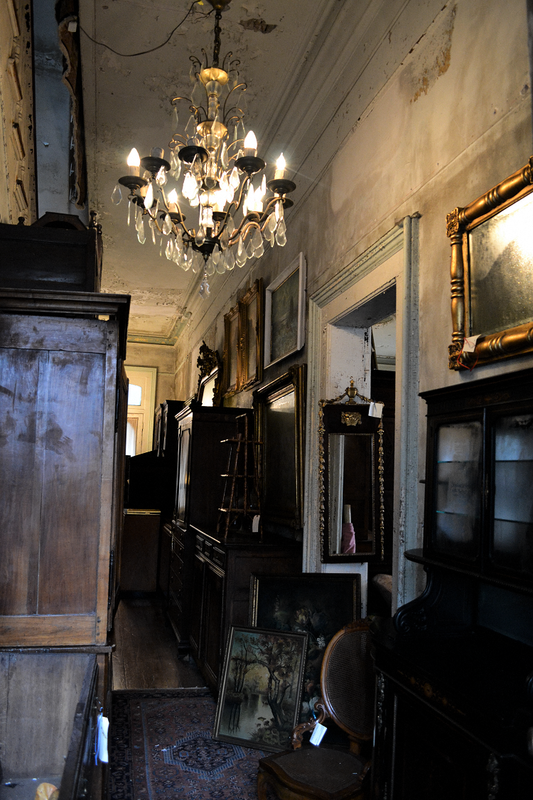 We did find a lovely antique shop that we passed by more than once that was four floors of beauty. 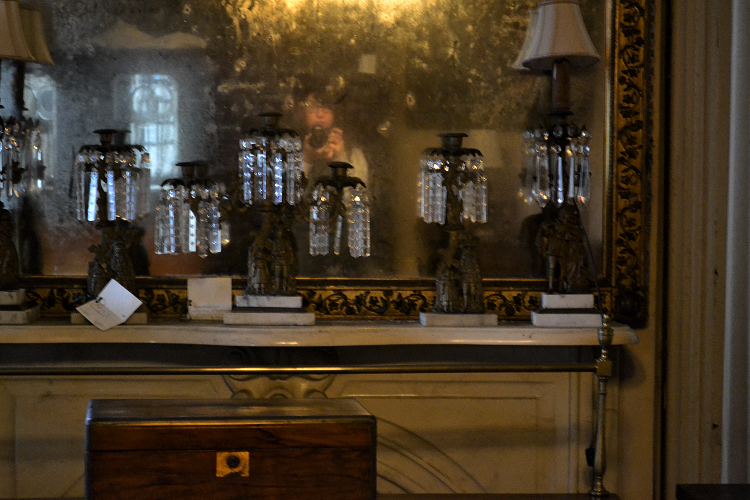 One thing we noticed was that the antique shops in Savannah had a great selection of period furniture. In Florida, you're lucky to find a nice selection of trinkets and accessories at an antique shop. Dirty mirror selfies entertained us. And above, the tall windows were outlined in solid iron. 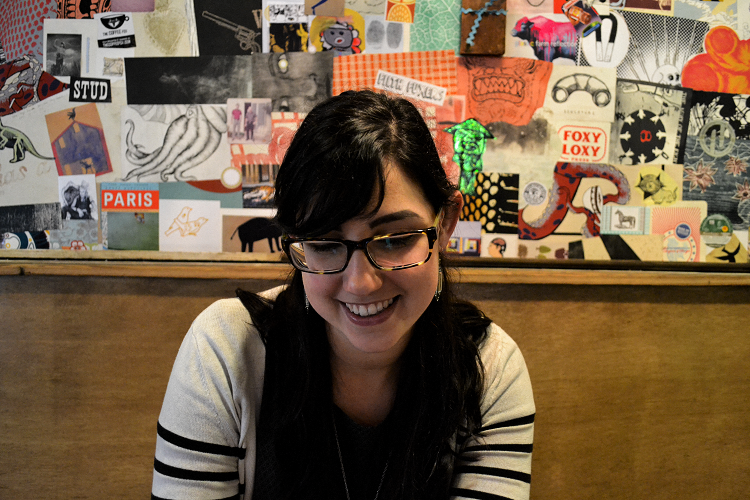 This building has ceilings so high I felt like I could breathe (something really dreamy for me, a girl that's 5'8"). 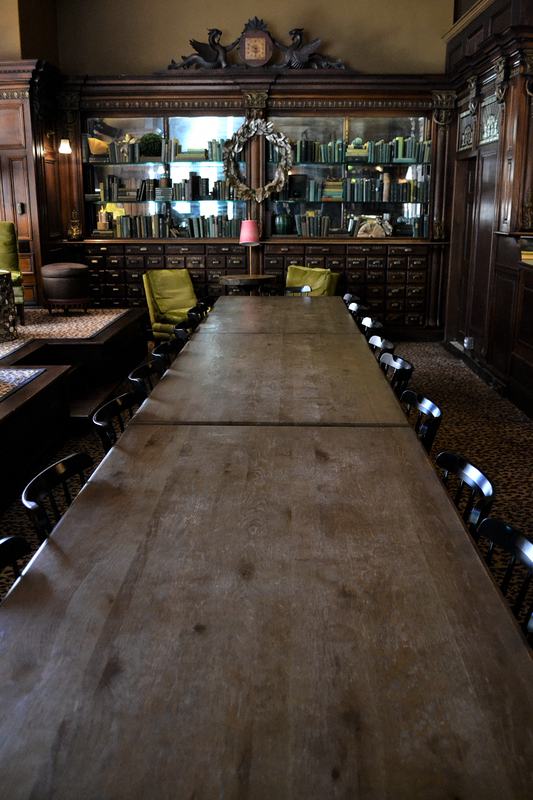 Although the walls and mouldings paint chipped in various places, it only added to it's charm. On the third floor, the window was open to a terrace, with more furniture for sale and a view to the neighboring mansions outdoor terrace. It all seemed quite luxurious. We got to the fourth floor, where the lights were turned off and we nearly turned around as fast as we walked up the stairs. With the open terrace windows, the wooden banisters felt soft and damp, and yet the wooden floors still creaked under the busy carpets. It's a building that I could happily live in, spending my days and my money restoring the property, keeping it's history. One thing we love to do is simply explore cities, walk around their streets, getting to know their bones. 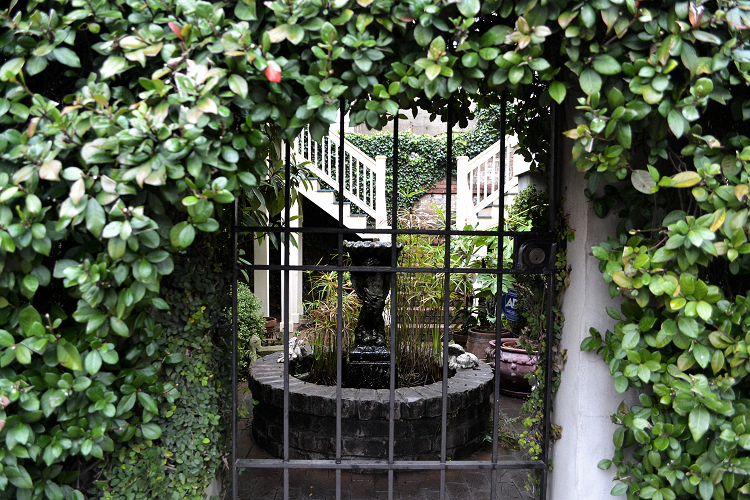 We'd walk and peek into private courtyards and glance up to marvel at houses covered in ivy. It's a beautiful little town with personality on every corner. 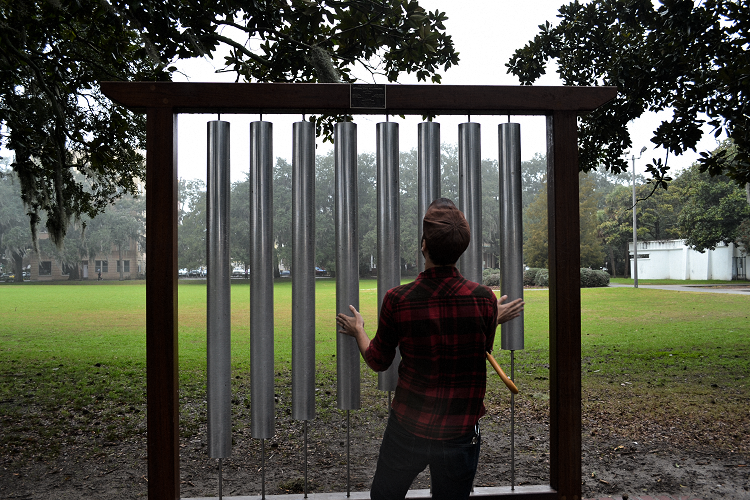 There was a park near us with a gorgeous fountain, tall statues, and a large xylophone. And of course, horse drawn carriages all along the streets. One thing we would have liked to do, but didn't know it was an option until we got there, was to schedule a walking tour. We saw a group or two walking around with old gentlemen in hats and canes, going over the historical sites and important pieces of history in Savannah. Although the weekend trip to Savannah was technically my birthday gift, S got me a little something else that he has known I wanted for a while now. 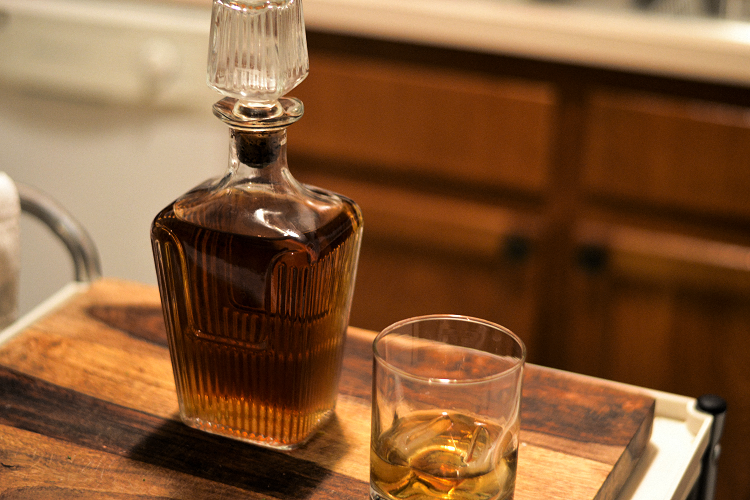 Every trip to an antique shop, I keep my eye out for a sturdy whiskey decanter that is also at a good price. S found one for me, cleaned it, filled it with bourbon, and wrapped it for me to open before we left for our trip. Most of the ones I've swooned over are the crystal style with lots of details. S surprised me by finding a lovely art deco style decanter that is the perfect start to a collection. Lastly, I have a few more photos to share, but it's taken me a while to get life sorted. We've had some troubles with our Visa application for Brazil, and we are supposed to leave in one week for South America. Our first stop is a week in Buenos Aires, which is fine if we don't have our Brazilian Visa, but at this point we still don't even have our passports back from the consulate. Our spirits have been really down lately, struggling with bureaucracy. Although I've taken out our suitcases and started packing our summer clothes, it's really a facade; it's hard to get excited when there may be last minute travel changes. You'll know everything is all set for our trip when you see me post a photo on Instagram with my passport back, safely in my arms. so so tiny and so quaint but oh so beautiful there. Also, how discouraging about your Visas! These things can be delayed for no reason at all, simply because the system doesn't work anymore. America really needs to get that sorted out. Hopefully you guys get your passports back soon--crossing my fingers for you. Changing travel plans is a pain! Good luck, friends! thanks kristyn, and i completely agree that i could end up in this area. or any area with this much beauty and history and the quaint little town feel!